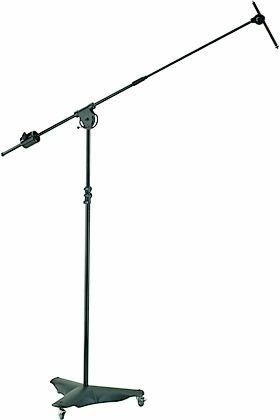 Mobile heavy steel microphone stand for studio or stage. 10 kg cast metal base, low centre of gravity for high level safety with 3 lockable castor wheels. Rod combination extends to over 2 m with additional locking mechanism. Extendable boom arm with a 3 kg counterweight and 5/8 inch connecting thread. Additional mini boom arm with 5/8 - and 3/8 - inch connecting thread, fully adjustable regardless of the position of the main boom arm, e.g. to use with studio microphones. zZounds is an authorized dealer of Konig & Meyer products.